Jesus College (in full: Jesus College in the University of Oxford of Queen Elizabeth's Foundation) is one of the constituent colleges of the University of Oxford in England. It is in the centre of the city, on a site between Turl Street, Ship Street, Cornmarket Street and Market Street. The college was founded by Elizabeth I on 27 June 1571 for the education of clergy, though students now study a broad range of secular subjects. A major driving force behind the establishment of the college was Hugh Price (or Ap Rhys), a churchman from Brecon in Wales. The oldest buildings, in the first quadrangle, date from the 16th and early 17th centuries; a second quadrangle was added between about 1640 and about 1713, and a third quadrangle was built in about 1906. Further accommodation was built on the main site to mark the 400th anniversary of the college, in 1971, and student flats have been constructed at sites in north and east Oxford. Blazon: Vert, three stags trippant argent attired or. The life of the college was disrupted by the English Civil War. Leoline Jenkins, who became principal after the war in 1661, put the college on a more stable financial footing. Little happened at the college during the 18th century, and the 19th century saw a decline in numbers and academic standards. Reforms of Oxford University after two Royal Commissions in the latter half of the 19th century led to removal of many of the restrictions placed on the college's fellowships and scholarships, such that the college ceased to be predominantly full of Welsh students and academics. Students' academic achievements rose in the early 20th century as fellows were appointed to teach in new subjects. Women were first admitted in 1974 and now form a large part of the undergraduate population. There are about 475 students at any one time; the Principal of the college is Sir Nigel Shadbolt. Former students include Harold Wilson (who was twice British Prime Minister), Norman Washington Manley (Chief Minister of Jamaica), T. E. Lawrence ("Lawrence of Arabia"), Angus Buchanan (winner of the Victoria Cross), and Viscount Sankey (Lord Chancellor). The university's professorship of Celtic is attached to the college, a post held by scholars such as Sir John Rhys, Ellis Evans and Thomas Charles-Edwards. Past or present fellows of the college include the historians Sir Goronwy Edwards and Niall Ferguson, the philosopher Galen Strawson, and the political philosopher John Gray. —  Elizabeth I, 27 June 1571. Price continued to be closely involved with the college after its foundation. On the strength of a promised legacy, worth £60 a year on his death (approximately £16,400 in present-day terms), he requested and received the authority to appoint the new college's principal, fellows and scholars. He financed early building work in the college's front quadrangle, but on his death in 1574 it transpired that the college received only a lump sum of around £600 (approximately £164,000 in present-day terms). Problems with his bequest meant that it was not received in full for about 25 years. As the college had no other donors at this time, "for many years the college had buildings but no revenue". Monument to Sir Eubule Thelwall, 1630, in Jesus College Chapel, Oxford. The main benefactor, other than the King, was Eubule Thelwall, from Ruthin, North Wales, who became Principal in 1621; he succeeded in securing a new charter and statutes for the college from James I, having spent £5,000 of his own money on the hall and chapel, which earned him the title of its second founder. Thelwall died on 8 October 1630, aged 68 and was buried in Jesus College Chapel where a monument was erected to his memory by his brother Sir Bevis Thelwall (Page of the King's Bedchamber and Clerk of the Great Wardrobe). Other benefactions in the 17th century include Herbert Westfaling, the Bishop of Hereford, left enough property to support two fellowships and scholarships (with the significant proviso that "my kindred shallbe always preferred before anie others"). Sir Eubule Thelwall (principal 1621–1630) spent much of his own money on the construction of a chapel, hall and library for the college. The library, constructed above an over-weak colonnade, was pulled down under the principalship of Francis Mansell (1630–1649), who also built two staircases of residential accommodation to attract the sons of Welsh gentry families to the College. The English Civil War "all but destroyed the corporate life of the college." Mansell was removed from his position as principal and Michael Roberts was installed. After the Restoration, Mansell was briefly reinstated as principal, before resigning in favour of Leoline Jenkins. It was Jenkins (principal 1661–1673) who secured the long-term viability of the college. On his death, in 1685, he bequeathed a large complex of estates, acquired largely by lawyer friends from the over-mortgaged landowners of the Restoration period. These estates allowed the college's sixteen fellowships and scholarships to be filled for the first time – officially, sixteen of each had been supported since 1622, but the college's income was too small to keep all occupied simultaneously. In 1713, the bequest of Welsh clergyman and former student Edmund Meyricke established a number of scholarships for students from north Wales, although these are now available to all Welsh students. The 18th century, in contrast to the disruption of the 17th century, was a comparatively quiet time for the college. A historian of the college, J. N. L. Baker, wrote that the college records for this time "tell of little but routine entries and departures of fellows and scholars". The Napoleonic Wars saw a reduction in the numbers of students and entries in the records for the purchase of muskets and other items for college members serving in the university corps. After the war, numbers rose, to an average of twenty new students per year between 1821 and 1830. However, debts owed to the college had increased, perhaps due to the economic effects of the war – by 1832, the college was owed £986 10s 5d (approximately £90000 in present-day terms). During the first half of the 19th century, the academic strength of the college diminished: scholarships were sometimes not awarded because of a lack of suitable candidates, and numbers fell: there were only seven new entrants in 1842. Ernest Hardy wrote in his history of the college in 1899 that it had been becoming "increasingly evident for years... that the exclusive connection with Wales was ruining the college as a place of education." A Royal Commission was appointed in 1852 to investigate the university. The college wished to retain its links with Wales, and initial reforms were limited despite the wishes of the commissioners: those scholarships that were limited to particular parts of Wales were opened to the whole of Wales, and half of the fellowships awarded were to remain open only to Welshmen "'if and so long as the Principal and Fellows shall deem it expedient for the interests of education in connection with the Principality of Wales'". All the scholarships at the college, except for two, and all the exhibitions were still restricted to students from Wales. The numbers of students at the college still fell, despite prizes being awarded for success in university examinations. Daniel Harper, principal from 1877 to 1895, noted the continuing academic decline. Speaking in 1879, he noted that fewer students from the college were reaching high standards in examinations, and that more Welsh students were choosing to study at other Oxford colleges in preference to Jesus. A further Royal Commission was appointed. This led to further changes at the college: in 1882, the fellowships reserved to Welshmen were made open to all, and only half (instead of all) of the 24 scholarships were to be reserved for Welsh candidates. Thereafter, numbers gradually rose and the non-Welsh element at the college increased, so that by 1914 only about half of the students were Welsh. During the First World War, "the college in the ordinary sense almost ceased to exist". From 129 students in the summer of 1914, numbers dropped to 36 in the spring of 1916. Some refugee students from Belgium and Serbia lodged in empty rooms in the college during 1916, and officers of the Royal Flying Corps resided from August 1916 to December 1918. After the war, numbers rose and fellowships were added in new subjects: history (1919 and 1933); theology (1927); physics (1934); a second fellowship in chemistry (1924); and modern languages (lectureship 1921, fellowship 1944). The improved teaching led to greater success in university examinations and prizes. In the inter-war years (1918–1939) Jesus was seen by some as a small college and something of a backwater; it attracted relatively few pupils from the public schools traditionally seen as the most prestigious. The college did, however, attract many academically able entrants from the grammar schools (particularly those in northern England and Scotland). Among these grammar-school boys was Harold Wilson, who would later become Prime Minister of the United Kingdom. During the Second World War, many of the fellows served in the armed forces or carried out war work in Oxford. The college remained full of students, though, as it provided lodgings for students from other colleges whose buildings had been requisitioned, and also housed officers on military courses. The college had its own science laboratories from 1907 to 1947, which were overseen (for all but the last three years) by the physical chemist David Chapman, a fellow of the college from 1907 to 1944. At the time of their closure, they were the last college-based science laboratories at the university. They were named the Sir Leoline Jenkins laboratories, after a former principal of the college. The laboratories led to scientific research and tuition (particularly in chemistry) becoming an important part of the college's academic life. The brochure produced for the opening ceremony noted that the number of science students at the college had increased rapidly in recent years, and that provision of college laboratories would assist the tuition of undergraduates, as well as attracting to Jesus College graduates of the University of Wales who wished to continue their research at Oxford. A link between one of the college science lecturers and Imperial Chemical Industries (ICI) led to 17 students joining ICI between the two World Wars, some, such as John Rose, reaching senior levels in the company. The laboratories became unnecessary when the university began to provide centralised facilities for students; they were closed in 1947. The quatercentenary of the college, in 1971, saw the opening of the Old Members' Buildings in the third quadrangle. Further student accommodation has been built at the sports ground and at a site in north Oxford. In 1974, Jesus was among the first group of five men's colleges to admit women as members, the others being Brasenose, Wadham, Hertford and St Catherine's; between one-third and one-half of the undergraduates are women. A long-standing rivalry with nearby Exeter College reached a peak in 1979, with seven police vehicles and three fire engines involved in dealing with trouble in Turl Street. Sir John Habakkuk (principal 1967–1984) and Sir Peter North (principal 1984–2005) both served terms as Vice-Chancellor of the university, from 1973 to 1977 and from 1993 to 1997 respectively. 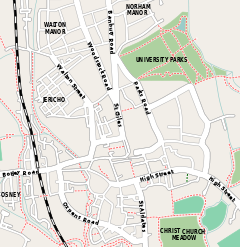 The main buildings are located in the centre of Oxford, between Turl Street, Ship Street, Cornmarket Street and Market Street. The main entrance is on Turl Street. The buildings are arranged in three quadrangles, the first quadrangle containing the oldest college buildings and the third quadrangle the newest. The foundation charter gave to the college a site between Market Street and Ship Street (which is still occupied by the college) as well as the buildings of a defunct university academic hall on the site, called White Hall. The buildings that now surround the first quadrangle were erected in stages between 1571 and the 1620s; the principal's lodgings were the last to be built. Progress was slow because the new college lacked the "generous endowments" that earlier colleges enjoyed. Before new buildings were completed, the students lived in the old buildings of White Hall. The chapel was dedicated on 28 May 1621, and extended in 1636. The architectural historian Giles Worsley has described the chapel's east window (added in 1636) as an instance of Gothic Revival architecture, rather than Gothic Survival, since a choice was made to use an outdated style – classical architecture had become accepted as "the only style in which it was respectable to build". Jonathan Edwards (principal from 1686 to 1712) is reported to have spent £1,000 (approximately £147,000 in present-day terms) during his lifetime on the interior of the chapel, including the addition of a screen separating the main part of the chapel from the ante-chapel (at the west end) in 1693. In 1853, stained glass by George Hedgeland was added to the east window. In 1863, the architect George Edmund Street was appointed to renovate the chapel. The arch of the chancel was widened, the original Jacobean woodwork was removed (save for the screen donated by Edwards and the pulpit), new seats were installed, new paving was placed in the main part of the chapel and a stone reredos was added behind the altar. Views of the changes have differed. On 21 October 1864, Building News reported that the restoration was nearing completion and was of "a very spirited character". It said that the new "handsome" arch showed the east window "to great advantage", with "other improvements" including a "handsome reredos". Ernest Hardy, principal from 1921 to 1925, said that the work was "ill-considered", described the reredos as "somewhat tawdry" and said that the Jacobean woodwork had been sold off too cheaply. In contrast, the architectural historian Nikolaus Pevsner called the reredos "heavily gorgeous". The principal of the college resides in the lodgings, a Grade I listed building, on the north side of the first quadrangle between the chapel (to the east) and the hall (to the west). They were the last part of the first quadrangle to be built. Sir Eubule Thelwall, principal from 1621 to 1630, built the lodgings at his own expense, to include (in the words of the antiquarian Anthony Wood) "a very fair dining-room adorned with wainscot curiously engraven". The shell-hood over the doorway (which Pevsner called "beautiful") was added at some point between 1670 and 1740; Pevsner dates it to about 1700. The hall has been said to be "among the most impressive of all the Oxford college halls", with its "fine panelling, austere ceiling, and its notable paintings". Like the chapel, it was largely built by Griffith Powell between 1613 and 1620, and was finally completed soon after his death in 1620. Pevsner noted the "elaborately decorated columns" of the screen (installed in 1634) and the dragons along the frieze, and said that it was one of the earliest examples in Oxford of panelling using four "L" shapes around a centre. In 1741 and 1742, the oak-beamed roof was covered with plaster to make rooms in the roof space. Pevsner described the 1741 cartouche on the north wall, which contains the college crest, as "large [and] rich". The hall contains a portrait of Elizabeth I, as well as portraits of former principals and benefactors. There are also portraits by court artists of two other monarchs who were college benefactors: Charles I (by Anthony van Dyck) and Charles II (by Sir Peter Lely). In 1640, Francis Mansell (appointed principal in 1630) began construction of a second quadrangle with buildings along the north and south sides; further work was interrupted by the English Civil War. Work began again in 1676, and the library (now the Fellows' Library) was completed by 1679. Under Jonathan Edwards (principal from 1688 to 1712), further rooms were built to complete the quadrangle; the project was completed just after his death in 1712. Pevsner described the second quadrangle as "a uniform composition", noting the "regular fenestration by windows with round-arched lights, their hood-moulds forming a continuous frieze". The Dutch gables have ogee sides and semi-circular pediments. 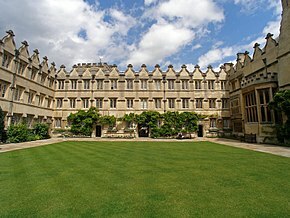 The writer Simon Jenkins said that the quadrangle has "the familiar Oxford Tudor windows and decorative Dutch gables, crowding the skyline like Welsh dragons' teeth and lightened by exuberant flower boxes". The Fellows' Library contains bookcases decorated with strapwork dating from about 1628, which were used in an earlier library in the college. Hardy's opinion was that, "if only it had an open timber roof instead of the plain ceiling, it would be one of the most picturesque College Libraries". Another author said (in 1914, after the provision of a library for undergraduates elsewhere in the quadrangle) that it was "one of the most charming of Oxford libraries, and one of the least frequented". It holds 11,000 antiquarian printed books and houses many of the college's rare texts, including a Greek bible dating from 1545 and signed by Philipp Melanchthon and others, much of the library of the scholar and philosopher Lord Herbert of Cherbury and 17th-century volumes by Robert Boyle and Sir Isaac Newton. The third quadrangle from the steps of the Old Members' Building looking east; the Ship Street entrance is through the archway on the left; the spire in the distance is the chapel of Exeter College. The long but narrow third quadrangle adjoins Ship Street, on the north of the site and to the west of the garden of the principal's lodgings, where the college has owned some land since its foundation. In the 18th century, this was home to the college stables. A fire in 1904 led to the demolition of the stables and the gateway to Ship Street. Replacement buildings adjoining Ship Street, effectively creating a third quadrangle for the college, were constructed between 1906 and 1908. It contained the college's science laboratories (now closed) and a new gate-tower, as well as further living accommodation and a library for students, known as the Meyricke Library, after a major donor – there had been an undergraduate library in the second quadrangle since 1865, known as the Meyricke Library from 1882 onwards. The Old Members' Building, which contains a music room, 24 study-bedrooms and some lecture rooms, was built between 1969 and 1971. It was built after a fundraising appeal to Old Members to mark the college's quatercentenary, and was opened by the Prince of Wales in 1971. The Fellows' Garden is between the Old Members' Building and the rear of the rooms on the west side of the second quadrangle. In 2002, a two-year project to rebuild the property above the college-owned shops on Ship Street was completed. As part of the work, the bottom floor was converted from rooms occupied by students and fellows into a new Junior Common Room (JCR), to replace the common room in the second quadrangle, which was by then too small to cope with the increased numbers of students. The college purchased 10 acres (0.040 km2; 0.016 sq mi) of land in east Oxford (near the Cowley Road) in 1903 for use as a sports ground. Residential accommodation was first built at the sports ground in 1967 (Thelwall House, rebuilt in 1998), with additions between 1988 and 1990 (Hugh Price House and Leoline Jenkins House). A further development, known as Hazel Court (after Alfred Hazel, principal 1925–1944), was built in 2000, bringing the total number of students who can be housed at the sports ground to 135. Donations from Edwin Stevens, an Old Member of the college, enabled the construction in 1974 of student flats at a site in north Oxford on the Woodstock Road, named "Stevens Close" in his honour. The college also owns a number of houses on Ship Street, which are used for student accommodation. It purchased a further site in Ship Street at a cost of £1.8M, which was converted at a projected cost of £5.5M to provide 31 student rooms with en-suite facilities, a 100-seat lecture theatre and other teaching rooms. The Ship Street Centre was officially opened by the Chancellor of the University of Oxford, Lord Patten of Barnes, on 25 September 2010. The Principal's Lodgings (left) and the chapel (right) are located within the First Quad of Jesus College. The college is run by the Principal and Fellows. The Principal must be "a person distinguished for literary or scientific attainments, or for services in the work of education in the University or elsewhere". The Principal has "pre-eminence and authority over all members of the College and all persons connected therewith" and exercises "a general superintendence in all matters relating to education and discipline". The current Principal, Sir Nigel Shadbolt, was appointed in 2015. Fourteen Principals have been former students of the college: Griffith Powell (elected in 1613) was the first and Alfred Hazel (elected in 1925) was the most recent. The longest-serving principal was Henry Foulkes, from 1817 to 1857. When the college was founded in 1571, the first charter installed David Lewis as Principal and named eight others as the first Fellows of the college. The statutes of 1622 allowed for 16 Fellows. There is now no limit on the number of Fellowships that the Governing Body can create. The college statutes provide for various categories of Fellows. Professorial Fellows are those Professors and Readers of the University who are allocated to the college by the University. One of these professorships is the Jesus Professor of Celtic, which is the only chair in Celtic Studies at an English university. Celtic scholars such as Sir John Rhys and Ellis Evans have held the position since its creation in 1877. The chair is currently vacant, having been held by Thomas Charles-Edwards until his retirement in 2011. The zoologists Charles Godfray and Paul Harvey are both Professorial Fellows. Official Fellows are those who hold tutorial or administrative appointments in the college. Past Official Fellows include the composer and musicologist John Caldwell, the historians Sir Goronwy Edwards and Niall Ferguson, the philosopher Galen Strawson and the political philosopher John Gray. There are also Senior and Junior Research Fellows. Principals and Fellows who retire can be elected as Emeritus Fellows. The college crest above the Ship Street entrance gate. A further category is that of Welsh Supernumerary Fellows, who are, in rotation, the Vice-Chancellors of Cardiff University, Swansea University, Lampeter University, Aberystwyth University, Bangor University and the University of Wales College of Medicine. There is one Welsh Supernumerary Fellow at a time, holding the position for not longer than three years. The first of these was John Viriamu Jones in 1897. The college formerly had a category of missionary Fellows, known as Leoline Fellows after their founder, Leoline Jenkins (a former principal). In his will in 1685, he stated that "It is but too obvious that the persons in Holy Orders employed in his Majesty's fleet at sea and foreign plantations are too few." To address this, he established two Fellowships at Jesus College, whose holders should serve as clergy "in any of his Majesty's fleets or in his Majesty's plantations" under the direction of the Lord High Admiral and the Bishop of London respectively. The last of these, Frederick de Winton, was appointed in 1876 and held his Fellowship until his death in 1932. This category was abolished in 1877 by the Oxford and Cambridge Universities Commission, without prejudice to the rights of existing holders such as de Winton. Another category of Fellowship that was abolished in the 19th century was that of the King Charles I Fellows, founded by King Charles in 1636 and tenable by natives of the Channel Islands in an attempt by him to "reclaim the Channel Islands from the extreme Calvinism which characterised them." The first such Fellow was Daniel Brevint. David Lloyd George, pictured in 1911, was elected an Honorary Fellow of the college in 1910 and said that he would prize no honour more highly. The Governing Body has the ability to elect "distinguished persons" to Honorary Fellowships. Under the current statutes of the college, Honorary Fellows cannot vote at meetings of the Governing Body and do not receive financial reward. They can be called upon, however, to help decide whether to dismiss or discipline members of academic staff (including the Principal). I wish to express to you and to the Fellows of Jesus College my deep sense of the great honour which you have done me in electing me to be one of your body. It is a very special gratification to me to be associated in this intimate way with Jesus College. As a Welshman, I have watched with pleasure and pride the prosperity, especially since you have been Principal, of the college which is so closely connected with our country, little thinking ever to find myself a member of it; and I can honestly say that no honour can fall to my lot which I shall prize more highly than this Fellowship which you have conferred upon me. Please accept and express to the Fellows of the college my hearty and sincere thanks. Ever yours sincerely, D. LLOYD GEORGE. The first three Honorary Fellows, all former students of the college, were elected in October 1877: John Rhys, the first Jesus Professor of Celtic (later an Official Fellow (1881–1895) and Principal (1895–1915)); the historian John Richard Green; and the poet Lewis Morris. The college noted in 1998 that the number of Honorary Fellows of the college was markedly below the average of other Oxford colleges and it adopted a more methodical approach to increase numbers. Seven Honorary Fellows were elected that year, followed by another five in 1999. The college's Honorary Fellows have included two Old Members who later became Prime Minister of their respective countries: Norman Washington Manley, who studied at Jesus College as a Rhodes Scholar and who was Chief Minister of Jamaica from 1955 to 1962, and Harold Wilson, who was twice British Prime Minister (1964–1970 and 1974–1976). For more information about the college's alumni, see the main list of alumni and further lists for clergy and theologians, for politicians, lawyers, and civil servants and for mathematicians, physicians, and scientists. Notable former students of the college have included politicians, scientists, writers, entertainers and academics. T. E. Lawrence ("Lawrence of Arabia"), known for his part in the Arab Revolt of 1916–1918 and for his writings including Seven Pillars of Wisdom, studied history at the college. His thesis on Crusader castles (the fieldwork for which marked the beginning of his fascination with the Middle East) is held in the Fellows' Library. Other former students include Pixley ka Isaka Seme (a founder and president of the African National Congress), Sir William Williams (Speaker of the House of Commons 1680–1685), and Lord Sankey (Lord Chancellor 1929–1935). Members of Parliament from the three main political parties in the United Kingdom have attended the college, as have politicians from Australia (Neal Blewett), New Zealand (Harold Rushworth), Sri Lanka (Lalith Athulathmudali) and the United States (Heather Wilson). The founders' hopes that their college would produce prominent Welsh clergy were fulfilled in no small measure when a former student, A. G. Edwards, was elected the first Archbishop of Wales when the Church in Wales was disestablished in 1920. Two later Archbishops of Wales, Glyn Simon (Archbishop from 1968 to 1971) and Gwilym Owen Williams (Archbishop 1971–1982) were also educated at the college. Celticists associated with the college include Sir John Rhys, Sir John Morris-Jones, and Sir Thomas (T. H.) Parry-Williams, whilst the list of historians includes the college's first graduate, David Powel, who published the first printed history of Wales in 1584, and the Victorian historian J. R. Green. Angus Buchanan won the Victoria Cross during the First World War. Record-breaking quadriplegic solo sailor Hilary Lister was also a student here, whilst from the field of arts and entertainment there are names such as Magnus Magnusson, presenter of Mastermind, the National Poet of Wales Gwyn Thomas, and television weather presenters Kirsty McCabe and Siân Lloyd. Nigel Hitchin, the Savilian Professor of Geometry at Oxford since 1997, studied at the college, as did Edward Hinds (a physicist who won the Rumford Medal in 2008), Chris Rapley (director of the Science Museum), and the zoologists Edward Bagnall Poulton and James Brontë Gatenby. There are about 325 undergraduates and 150 postgraduates. About half of the undergraduates studied at state schools before coming to Oxford, and about 10% are from overseas. Students from the college participate in a variety of extracurricular activities. Some contribute to student journalism for Cherwell or The Oxford Student. The Turl Street Arts Festival (a week-long student-organised event) is held annually in conjunction with the two other colleges on Turl Street, Exeter and Lincoln colleges. The festival, which takes place in Fifth Week of Hilary term, includes exhibitions, plays and concerts. Although the college does not award choral scholarships, the chapel choir is well-attended by college members and others. The choir is non-auditioning for college members, and is run by one or more undergraduate organ scholars. Every three years, the college co-organises the Somerville-Jesus Ball on the grounds of Somerville College. The next ball will be held in 2019, with a capacity of 1500 people. In common with many Oxford colleges, Jesus provides sporting facilities for students, including playing fields at a site in east Oxford off the Cowley Road known as Bartlemas (for its proximity to St Bartholomew's Chapel). Football, rugby, netball, field hockey, cricket, and tennis can be played there. Squash courts are at a separate city-centre site on St Cross Road. The college also provides students with membership of the university's gym and swimming pool on Iffley Road. Jesus College Boat Club (commonly abbreviated to JCBC) is the rowing club for members of the college. The club was formed in 1835, but rowing at the college predates the foundation of the club: a boat from the college was involved in the earliest recorded races between college crews at Oxford in 1815, when it competed against a crew from Brasenose College. These may have been the only two colleges who had boats racing at that time, and the Brasenose boat was usually victorious. Neither the men's nor the women's 1st VIIIs have been "Head of the River" during Eights Week, the main college races, but the women's 1st VIII was Head of the River in the spring races, Torpids, between 1980 and 1983. Jesus boats have also had other successful seasons: the 1896 Jesus College boat had a reputation of being one of the faster boats in the university, and the women's 1st VIII of 1993 won their "blades" in the first divisions of both Torpids and Eights Week, an achievement that led to the crew being described in the Jesus College Record as vying "not just for the College team of the decade, but perhaps for the team of the last three decades", in any sport. A number of college members have rowed for the university against Cambridge University in the Boat Race and the Women's Boat Race. Barney Williams, a Canadian rower who studied at the college, won a silver medal in rowing at the 2004 Summer Olympics, and participated in the Boat Race in 2005 and 2006. Other students who rowed while at the college have achieved success in other fields, including John Sankey, who became Lord Chancellor, Alwyn Williams, who became Bishop of Durham, and Maurice Jones, who became Principal of St David's College, Lampeter. Another college rower, James Page, was appointed Secretary of the Amateur Rowing Association and coached both the Oxford and Cambridge University boat clubs. The college boathouse, which is shared with the boat club of Keble College, is in Christ Church Meadow, on the Isis (as the River Thames is called in Oxford). It dates from 1964 and replaced a moored barge used by spectators and crew-members. The last college barge had been purchased from one of the Livery Companies of the City of London in 1911. It is now a floating restaurant further down the Thames at Richmond, and for some years was painted in the college scarf of green and white. Education in Wales had been stimulated by the foundation of schools during the reigns of Henry VIII and Edward VI: King Henry VIII Grammar School in Abergavenny 1542 and Christ College, Brecon 1541 were established in the 1540s, and Friars School, Bangor dates from 1557. However, despite the numbers of Welsh students coming to Oxford University as a result, there was no special provision for Welshmen before 1571. Despite the links with Wales that Hugh Price and many of the founding Fellows had, neither the 1571 charter nor any of the later charters limited entry to the college to Welshmen. Nevertheless, the college students were predominantly Welsh from the outset, and the college became "the pinnacle of the academic ambition of the young men of Wales". Many of the fellows in the past were Welsh, since when new fellowships were created by benefactions (often by people of Welsh descent) there was frequently a stipulation that the recipients would be related to the donor or come from a specified part of Wales. These specific limitations were removed as part of reforms of Oxford University during the 19th century. Between 1571 and 1915, only one Principal (Francis Howell, 1657–1660) was not from Wales or of Welsh descent. Jesus still has a particular association with Wales and is often referred to as "the Welsh college". The college is home to the university's Professor of Celtic, and a specialist Celtic library in addition to the college's normal library. Meyrick scholarships, from the bequest of Edmund Meyrick in 1713, are awarded for academic merit where the student is a native of Wales (or the child of a native of Wales), able to speak Welsh or was educated for the last three years of secondary school in Wales. The college's undergraduate gossip sheet is entitled The Sheepshagger in allusion to an offensive joke about Welsh people's supposed penchant for sheep. Furthermore, the Welshness of the College is self-perpetuating, as Welsh students will often apply to Jesus because it is seen as the Welsh college. Old members recall the college having a majority of Welsh members until well into the 20th century; today, however, around 15% of undergraduates come from Wales. For comparison, residents of Wales comprise just under 5% of the United Kingdom population (2.9 million out of a total of 58.8 million at the time of the 2001 Census). In modern times, the Welsh roots of the college come to the fore most prominently on Saint David's Day. The feast is marked by a choral Evensong in the chapel, decorated for the occasion with daffodils. The service, including music, is conducted entirely in Welsh (despite only a small minority of the choir usually being native speakers of the language). It is generally well attended by members of the Welsh community in Oxford. The college's annual St. David's Day Dinner traditionally culminates with the serving of Sir Watkin Williams-Wynn's Pudding. The name recalls the Welsh politician and prominent Jacobite who attended the college early in the 18th century. The Welsh connection is also evident in the college's outreach activities, such as organising a summer school for Welsh students in partnership with the Welsh Government's Seren Network. The college's collection of silverware includes a silver-gilt punch bowl, presented by Sir Watkin Williams-Wynn in 1732. The bowl, which weighs more than 200 ounces (5.7 kg) and holds 10 imperial gallons (45 L), was used at a dinner held in the Radcliffe Camera in 1814, to celebrate what was supposed to be the final defeat of Napoleon. Those present at the dinner included the Tsar, the King of Prussia, Blücher, Metternich, the Prince Regent, the Duke of York and the Duke of Wellington. There is a college tradition that the bowl will be presented to anyone who can meet two challenges. The first is to put arms around the bowl at its widest point; the second is to drain the bowl of strong punch. The bowl measures 5 feet 2 inches (1.57 m) at its widest point, and so the first challenge has only been accomplished rarely; the second challenge has not been met. 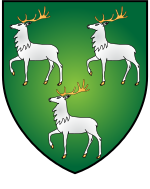 The college's coat of arms, in heraldic terminology, is Vert, three stags trippant argent attired or. The arms are not those of Hugh Price. His arms, according to their depiction in the margins of his will, were gules (red) a chevron ermine between three fleurs-des-lis. The arms were not granted or authorised by the College of Arms, but the length of time for which they have been used has given them a prescriptive authority. The earliest depiction of the arms was thought to be about 1590, in a document held by the College of Arms, which refers to the stags appearing on a blue (in heraldic terms, azure) background but subsequent examination of this document by Peter Donoghue, Bluemantle Pursuivant shows that the arms were added c.1680 . The first known appearance of the arms is therefore on John Speed’s Map of Oxfordshire in 1605 with a blue field. The green field made its appearance by 1619 in an armorial quarry painted by one of the Van Linge brothers. The green background became generally (but not universally) used by the 1730s, still appearing as horizontal hatchings indicating azure were in use on bookplates for the college library as late as 1761. There are similarities with the arms of Lincoln College, Oxford, where one of the elements consists of three golden stags statant (standing still); this was derived from the coat of arms of Lincoln's so-called "second founder", Thomas Rotherham. It was once claimed that Jesus had stolen the stags from Lincoln, but the counter-argument (from an antiquarian with close Lincoln connections) was that the origins of each were distinct. One suggestion (by Paul Langford, the Rector of Lincoln College) is that Jesus College continued the arms adopted by a theological college founded by Rotherham in his home town – Jesus College, Rotherham – which had been suppressed in the time of Edward VI. The arms of Maud Green, Lady Parr, mother of Catherine Parr (the last of the six wives of Henry VIII and stepmother to Elizabeth I), were of three stags on an azure background, and this became one of the elements of the arms of Catherine Parr on her marriage. Her sister, Anne Parr, married William, 1st Earl of Pembroke, whose grandson (the 3rd Earl, also called William) became the first Visitor of the college in 1622. Maud Green's arms are depicted in plasterwork from about 1592 at Powis Castle, owned by a kinsman of the earls. One writer has suggested that the college may have adopted the arms in order to be associated with one of the leading Welsh families of the day. This latter theory is not heraldically tenable as the quarters in an achievement after the first and pronominal quarter brought into the family by marriage to heraldic heiresses cannot meaningfully exist on their own to represent the person who now quarters them. It is more probable then that the arms of the College really are those of Archbishop Rotherham and were assumed to be those of the College by John Speed who saw them on one of its buildings in 1605 when preparing his map. Lawrence Hall in Ship Street was given to Rotherham in 1476 and leased to Jesus in 1572. It may well have displayed the Archbishop’s arms in its structure as did the building on the south side of the front quad of Lincoln which he completed. These arms for Jesus College could not be confused with those of Lincoln as that College, since 1574, already had a complex tripartite coat granted to it by Richard Lee, Portcullis Pursuivant, in which the colour of the stags in the centre section had been changed to Or (gold) and their attitude to statant. Grace is said by a scholar of the college at Formal Hall (the second, more elaborate sitting of dinner). Nos miseri et egentes homines pro cibo quem ad alimoniam corporis sanctificatum nobis es largítus, ut eo utamur grati, tibi Deus omnipotens, Pater caelestis, gratias reverenter agimus, simul obsecrantes ut cibum angelorum, verum panem caelestem, verbum Dei aeternum, Dominum nostrum Iesum Christum nobis impertiaris, ut illo mens nostra pascatur et per carnem et sanguinem eius foveamur, alamur et corróboremur. We wretched and needy men reverently give thee thanks, almighty God, heavenly Father, for the food which thou hast sanctified and bestowed for the sustenance of the body, so that we may use it thankfully; at the same time we beseech thee that thou wouldst impart to us the food of angels, the true bread of heaven, the eternal word of God, Jesus Christ our Lord, so that our mind may feed on him and that through his flesh and blood we may be nourished, sustained and strengthened. Quandoquidem nos, Domine, donis tuis, omnipotens et misericors Deus, exsatiasti, effice ut posthac quid per nos fieri aut secus velis diligenter observemus, atque illud animo sincero effectum praestemus, per Iesum Christum Dominum nostrum. Versicle — Domine, salvam fac Reginam. Response — Et exaudi nos in die qua invocaverimus te. Deus, in cuius manu sunt corda regum, qui es humilium consolator et fidelium fortitudo et protector omnium in Te sperantium, da Reginae nostrae Elizabethae populoque Christiano triumphum virtutis tuae scienter excolere, ut per te semper reparentur ad gloriam, per Christum Dominum nostrum. Since, O Lord, almighty and most merciful God, thou hast satisfied us with thy gifts, ensure from henceforth that we may diligently regard what thou wishest to be done or left undone by us and cause this to be effected with sincere heart, through Jesus Christ our Lord. Versicle: — O Lord, keep the Queen safe. Response: — And hear us in the day in which we call on thee. God in whose hands are the hearts of Kings, who art the consoler of the humble and the protector of all who hope in thee, grant to our Queen Elizabeth and to the Christian people to celebrate wisely the triumph of thy goodness so that they may be always renewed to glory through thee, through Jesus Christ our Lord. ^ a b "New Principal, Jesus College". 3 August 2015. ^ "Student statistics". University of Oxford. 2017. Retrieved 31 August 2018. ^ "Jesus College – The Beginning". Jesus College, Oxford. 8 April 2001. Archived from the original on 3 March 2007. Retrieved 10 August 2008. ^ a b c d UK Retail Price Index inflation figures are based on data from Clark, Gregory (2017). "The Annual RPI and Average Earnings for Britain, 1209 to Present (New Series)". MeasuringWorth. Retrieved 27 January 2019. ^ a b "Jesus College, Oxford – The Founders". Jesus College, Oxford. 14 November 2000. Archived from the original on 26 October 2006. Retrieved 24 February 2008. ^ Speight, Martin (2004). "Westfaling, Herbert (1531/2–1602)". ODNB. Retrieved 29 June 2006. ^ a b c Jesus College, Oxford (14 May 2002). "Benefactors". Archived from the original on 29 March 2006. Retrieved 29 June 2006. ^ a b Baker (1954), p. 265. ^ Pimlott, Ben (1992). 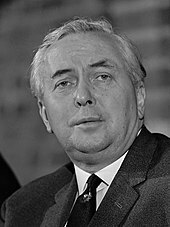 Harold Wilson. London: Harper Collins. ISBN 0-00-215189-8. ^ Jesus College, Oxford (18 July 2002). "The 20th Century". Archived from the original on 1 January 2006. Retrieved 4 April 2006. ^ Bowen, E. J.; rev. Laidler, Keith J. "Chapman, David Leonard (1869–1958)". ODNB. Retrieved 2 April 2009. ^ a b Long, Derek (1996) . "Sir Leoline Jenkins Laboratories 1907–47". Jesus College Record: 46–57. ^ a b Hibbert, Christopher, ed. (1992). "Jesus College". The Encyclopaedia of Oxford. London: Pan Macmillan. p. 201. ISBN 0-333-48614-5. ^ a b c d "Accommodation". Jesus College, Oxford. 3 September 2001. Archived from the original on 24 April 2009. Retrieved 22 June 2009. ^ "Women at Oxford". University of Oxford. Retrieved 12 June 2016. ^ a b "The Modern Day". Jesus College, Oxford. 27 September 2005. Archived from the original on 24 April 2009. Retrieved 9 July 2009. ^ "The Record" (PDF). Jesus College. 2018. ^ Tyack, Geoffrey (1998). Oxford: an architectural guide. Oxford University Press. p. 82. ISBN 978-0-19-817423-3. Retrieved 26 June 2009. ^ Worsley, Giles (1993). "The Origins of the Gothic Revival: A Reappraisal: The Alexander Prize Essay". Transactions of the Royal Historical Society. Sixth Series. Royal Historical Society. 3: 108–109. JSTOR 3679138. ^ "Jesus College Principal's Lodgings". Images of England. English Heritage. 2007. Retrieved 15 June 2009. ^ Burnett, Richard George (1950). Oxford and Cambridge in pictures. Phoenix House. p. 82. ISBN 978-1-125-55554-5. ^ "Hall". Jesus College, Oxford. 29 December 2000. Archived from the original on 15 July 2008. Retrieved 22 June 2009. ^ Jenkins, Simon (2009). England's Thousand Best Houses. Penguin Books. p. 680. ISBN 978-0-14-103929-9. ^ Gibson, Strickland (1914). Some Oxford libraries. Oxford University Press. p. 89. ISBN 1-55014-330-1. OCLC 3791497. Retrieved 28 June 2009. ^ "College News and Notes". Jesus College Record: 6–7. 1994 . ^ "Fellows' Library Appeal launched" (PDF). Jesus College Newsletter (8): 1–2. 2007. Archived from the original (PDF) on 3 October 2009. Retrieved 25 June 2009. ^ a b "The Third Quad". Jesus College, Oxford. 29 December 2000. Archived from the original on 24 April 2009. Retrieved 23 June 2009. ^ "Old Members' Building". Jesus College, Oxford. 29 December 2000. Archived from the original on 12 April 2009. Retrieved 22 June 2009. ^ Clarke, Peter (2002). "College News and Notes". Jesus College Record: 3–5. ^ North, Peter (2001). "College News and Notes". Jesus College Record: 5. ^ "Ship Street". Jesus College, Oxford. 29 December 2000. Archived from the original on 24 April 2009. Retrieved 22 June 2009. ^ "Opening of Ship Street Centre". Jesus College, Oxford. 25 September 2010. Archived from the original on 18 October 2010. Retrieved 6 October 2010. ^ Statute III "The Principal", clause 1 "Qualifications"
^ Statute III, clause 4(a) "Duties"
^ Statute IV "The Fellows", clause 3 "Number of Fellowships"
^ a b c Statute IV, clause 1 "Classes of Fellows and qualifications"
^ Statute IV, clause 5 "Professorial Fellowships"
^ "Celtic at Oxford". Retrieved 15 July 2007. ^ "Professor Thomas Charles-Edwards". Jesus College, Oxford. 18 January 2006. Archived from the original on 1 June 2008. Retrieved 24 July 2008. ^ Lord Krebs (2011). "The Principal's Report". Jesus College Record: 5–6. ^ "Charles Godfray". Department of Zoology, University of Oxford. 6 March 2008. Archived from the original on 30 September 2008. Retrieved 3 April 2008. ^ "Professor Paul Harvey". Jesus College, Oxford. 23 May 2008. Archived from the original on 1 June 2008. Retrieved 7 July 2008. ^ De'Ath, John (1999). "Fellows' News". Jesus College Record: 15. ^ "Sir Goronwy Edwards – A loyal and learned Welshman". The Times. 21 June 1976. p. 16. ^ Clarke, Peter (2002). "Fellows' News". Jesus College Record: 18. ^ De'Ath, John (2000). "Fellows' News". Jesus College Record: 19. ^ De'Ath, John (1998) . "Fellows' News". Jesus College Record: 15. ^ Statute IV, clause 4 "Welsh Supernumerary"
^ Hazel, Alfred (3 May 1932). "The Rev. F. H. de Winton". The Times. p. 19. ^ a b Statute IV "The Fellows", clause 23 "Honorary Fellowships"
^ Krebs, Lord (2007). "The Principal's Report". Jesus College Record: 10. ^ Clarke, Peter (2004). "Editorial". Jesus College Record: 4. ^ "News from the Universities". The Times. 25 October 1967. p. 12. ^ "Memorial Services: All Souls and Jesus College". Oxford University Gazette. University of Oxford. 16 January 2003. Archived from the original on 29 December 2005. Retrieved 30 July 2008. ^ "University Intelligence". The Times. 24 May 1902. p. 13. ^ "Fellowship for Sir S. Evans". The Times. 19 March 1918. p. 3. ^ "University Intelligence". The Times. 12 July 1910. p. 5. ^ De'Ath, John (1999) . "Fellows' News". Jesus College Record: 12. ^ Sealy, T. E. "Manley, Norman Washington (1893–1969)". ODNB. Retrieved 14 July 2007. ^ Jesus College, Oxford (27 December 2005). "History". Jesus College Prospectus. Archived from the original on 1 July 2007. Retrieved 29 March 2007. ^ a b c d e "Notable Old Members". Jesus College, Oxford. 2007. Archived from the original on 4 August 2009. Retrieved 21 September 2009. ^ Gustafson, Barry. "Rushworth, Harold Montague 1880–1950". Dictionary of New Zealand Biography. Ministry for Culture and Heritage. Retrieved 5 April 2011. ^ "Old Members' Notes and News". Jesus College Record: 72–73. 1994 . ^ "Wilson, Heather, (1960 – )". Biographical Directory of the United States Congress. United States Congress. Retrieved 4 February 2009. ^ Duncan-Jones, A. S; Jones, O. W. "Edwards, Alfred George (1848–1937)". ODNB. Retrieved 14 July 2007. ^ Fraser, John; Williams, Mari A. "Rhŷs, Sir John (1840–1915)". ODNB. Retrieved 14 July 2007. ^ Williams, I.; Rees, D. Ben. "Jones, Sir John Morris- (1864–1929)". ODNB. Retrieved 18 July 2007. ^ Evans, Ellis. "Williams, Sir Thomas Herbert Parry- (1887–1975)". ODNB. Retrieved 25 July 2007. ^ Fritze, Ronald H. "Powel, David (1549x52–1598)". ODNB. Retrieved 10 April 2008. ^ Brundage, Anthony. "Green, John Richard (1837–1883)". ODNB. Retrieved 14 July 2007. ^ Dunhill, Rosemary (2006). "From the Archives: A Jesus College VC" (PDF). Jesus College Newsletter (5): 10. Archived from the original (PDF) on 1 July 2007. Retrieved 15 July 2007. ^ Villiers, Charles (2006) [[[Hilary Term]]]. "To France by mouth". Oxford Today. University of Oxford. Archived from the original on 23 August 2007. Retrieved 1 January 2008. ^ "National Poet of Wales: Gwyn Thomas". Academi. Archived from the original on 13 September 2007. Retrieved 23 July 2007. ^ Sale, Jonathan (10 May 2007). "Passed/Failed: An education in the life of Siân Lloyd, weather presenter – "I'm the world's best crammer"". The Independent. Retrieved 31 July 2009. ^ "Hitchin's home page". Mathematical Institute, University of Oxford. Retrieved 15 July 2007. ^ "Honours, Awards and Qualifications". Jesus College Record: 118. 2008. ^ "New Director of Science Museum". Jesus College, Oxford. 23 July 2007. Archived from the original on 5 October 2009. Retrieved 2 March 2009. ^ a b "Jesus College". University of Oxford. 4 March 2009. Retrieved 21 September 2009. ^ "The Somerville-Jesus Surrealism Ball: Enter the Subconscious Mind". 7 June 2016. ^ Sherwood, W. E. (1900). Oxford Rowing: A History of Boat-Racing at Oxford from the Earliest Times. Oxford and London: Henry Frowde. p. 8. ^ "Oriel remain unruffled at the top". The Times. 3 March 1980. p. 10. ^ "Oriel wear crown for ninth year in a row". The Times. 2 March 1981. p. 9. ^ "Oriel keep headship in Torpids". The Times. 1 March 1982. p. 17. ^ "Twelve in a row for Oriel". The Times. 28 February 1983. p. 20. ^ De'Ath, John (1994) . "Sports Report 1992–93". Jesus College Record: 70. ^ Bennett, Ivor; Pearce, Claire (2006). "Sports Report 2005–2006". Jesus College Record: 91. ^ "Mr. James H. Page". The Times. 17 December 1977. p. 14. ^ De'Ath, John (2001). "The College Barge". Jesus College Record: 52–53. ^ a b "Jesus College – The Welsh College". Jesus College, Oxford. 12 November 2000. Archived from the original on 15 July 2008. Retrieved 10 August 2008. ^ Davies, John (2007). A History of Wales. Penguin Books. p. 250. ISBN 0-14-028475-3. ^ "Scholarships and Exhibitions (Undergraduates)". Jesus College, Oxford. 20 September 2005. Archived from the original on 26 September 2006. Retrieved 25 April 2008. ^ Garnier, Edward (23 January 2003). "Debate on Hunting Bill, House of Commons Standing Committee F". Retrieved 15 March 2007. ^ a b Jesus College, Oxford (13 February 2007). "Jesus College and Wales". Archived from the original on 26 September 2006. Retrieved 15 March 2007. ^ "Census 2001 Population Pyramids – Wales". Office for National Statistics. Retrieved 7 July 2009. ^ "Census 2001 Population Pyramids – United Kingdom". Office for National Statistics. Retrieved 7 July 2009. ^ Thomas, Peter D. G. (May 2008). "Wynn, Sir Watkin Williams, third baronet (1693?–1749)". ODNB. Retrieved 7 July 2009. ^ Hume, Colette (15 March 2017). "Oxford Uni taster for Welsh students". BBC News. Retrieved 8 June 2018. ^ Glanville, Philippa (2004). "A Treasured Inheritance". Oxford Today. Oxford University Public Affairs Directorate. 16 (3). Archived from the original on 9 October 2006. Retrieved 15 March 2007. ^ Popkin, Michael (November 2001). "War and Peace". Oxford Inscriptions: Inscribed Stones and Plaques in Oxford. Archived from the original on 15 March 2007. Retrieved 15 March 2007. ^ Thomas, Llewellyn (1891). "Jesus College". In Clark, Andrew (ed.). The colleges of Oxford: their history and traditions. London: Methuen & Co. p. 387. Retrieved 19 August 2008. ^ Oxford University Calendar2004-2005. Oxford University Press. 2004. p. 255. ISBN 0-19-951904-8. ^ a b c Langford, Paul (2008). "Revisiting the Heraldic Wars of the Turl: Lincoln and Oxford". Jesus College Record: 48–52. ^ Walker, David (2004). "Price, Hugh". ODNB. Retrieved 14 July 2009. ^ a b c Massa, David (1995) . "The College Arms". Jesus College Record: 44–49. ^ Eden, F. Sydney (February 1938). "Oxford Heraldic Quarries". The Connoiseur: 81 & 106. ^ Rees, David (1998) . "Jesus College Coat of Arms: An addendum". Jesus College Record: 41–42. ^ Langford's 2008 article refers to Landon, Percy (1893–94). "Notes on the Heraldry of Oxford Colleges". Archaeologia Oxoniensis. ^ Morgan, Gerald (2008). "Were we ever Tudors?". Jesus College Record: 37. ^ Murray, Hugh (2010). "The Arms of Jesus College, A Reappraisal". Jesus College Record: 44–47. ^ "Food". Jesus College, Oxford. 25 June 2009. Archived from the original on 31 May 2008. Retrieved 10 July 2009. ^ a b Jesus College, Oxford (24 June 2002). "Graces". Archived from the original on 21 March 2009. Retrieved 9 July 2009. ^ a b Adams, Reginald (1992). The College Graces of Oxford and Cambridge. Oxford: Perpetua Press. pp. 68, 95. ISBN 1-870882-06-7. From a card for use by the scholar on duty; translations by J. G. Griffith (Fellow of the college, Public Orator of the University 1973–1980). "Jesus College Statutes". Jesus College, Oxford. Archived from the original (PDF) on 23 December 2012. Retrieved 24 July 2008. Baker, J. N. L. (1954). "Jesus College". In Salter, H. E.; Lobel, Mary D. (eds.). A History of the County of Oxford Volume III – The University of Oxford. Victoria County History. Institute of Historical Research, University of London. ISBN 978-0-7129-1064-4. Retrieved 22 June 2009. Baker, J. N. L. (1971). Jesus College, Oxford 1571–1971. London: Oxonian Press Ltd. ISBN 0-9502164-0-2. Gibson, Strickland (1954). "The University of Oxford". In Salter, H. E.; Lobel, Mary D. (eds.). A History of the County of Oxford Volume III – The University of Oxford. Victoria County History. Institute of Historical Research, University of London. Retrieved 10 August 2008. Hardy, E. G. (1899). Jesus College. London: F. E. Robinson & Co. OCLC 7961179. Retrieved 22 June 2009. Pevsner, Nikolaus; Sherwood, Jennifer (1974). "Jesus College". The Buildings of England – Oxfordshire. Yale University Press. ISBN 0-300-09639-9. Jesus College, as described in "Literary Landmarks of Oxford"
Wikimedia Commons has media related to Jesus College, Oxford.